Crikey! The Crocodile Hunter, Steve Irwin and his wife Terri take us on a wild voyage to the top tip of Australia, and then to Ayers Rock, discovering wildlife along the way. Before I continue, I'll add these paragraphs as I always do for this series. For those of you still unfamiliar with the series, Steve Irwin owns and operates Australia Zoo in Queensland with his wife Terri. He has a true love for all creatures and an exuberance that must be seen to be believed. If you didn't know better, you would think that it was forced however over time you do get dragged in by his boyish enthusiasm. We should give credit where it's due also. It's easy to overlook that Irwin is an expert with these creatures and a veritable fount of information. 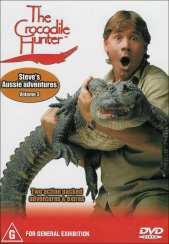 The one thing that constantly amazes me with every disc in this series is that Steve's presentation and his in your face style makes for riveting viewing and I found kids are entranced by it, the younger children even preferring the Crocodile Hunter over your traditional children's viewing. For those who are sensitive to hurt animals be warned that Steve and Terri spend most of the first episode trying to save animals hurt by bush fires lit by people back burning. He quite validly points out that we overlook the fact that a lot of animals have their homes in areas that we back burn in and lose their lives as a result. There are some terribly burned animals that reduced Steve to tears during the episode. The trip to Ayers Rock is more of a reverential journey as Steve explores the great rock and the reptiles that inhabit the surrounds. Aboriginal custom does not permit Steve to explore the Rock itself which is a shame, however in respect to our indigenous people, we do get to see areas surrounding the ancient monument. As with every disc in this series, the quality of the DVD is very good and makes nice use of Dolby Digital. The vision and audio is crisp and clear and the extras are entertaining and informative.